Aguga genevensis seems a bit less thuggish than the commonly sold A. reptans. In a sense, the uniform growth habit is beautiful, but it's very low-growing (which means that weeds do sometimes pop up through the foliage) and I do get nervous about controlling its spread or removing any bits that spread too far. UPDATE 4/17 - Decided all the exotic Ajugas were too aggressive, forming monocultures and not offering enough ecosystem benefits. Tried to rip them out. This patch right here was the largest and the hardest to remove. Spent hours digging it out over the winter. This spring, a good bit has come right back from roots I missed. Argh! I feel I've learned a lot over the past 5+ years gardening in Middle Tennessee. I've found all sorts of plants - trees, shrubs, perennials and annuals - that can survive and even thrive in awful compacted clay with a tough-love regimen of low-input style gardening (i.e., benign neglect -- no fertilizer, supplemental water only under severe drought conditions). Yet, I still spend a lot of time these days thinking about how to cover bare ground. Ajuga tenorii 'Chocolate Chip' is probably the easiest-to-control Ajuga, but the flip side is that it spreads the slowest. UPDATE - It does spread more slowly than A. genevensis or A. reptans, but it offers just as few ecosystem benefit, little aesthetic appeal, still forms a dense monoculture and still resists removal (although these clumps were not as established as A. genevensis and thus have not come back as vigorously after my attempts to dislodge them). So you want to put in a big garden bed - some trees, some shrubs, some perennials - and get rid of let's say 1/4 or 1/2 your lawn in one fell swoop. But what do you use to cover ground among the plants to prevent the new bed from becoming a weedy mess? That may actually not be a bad choice for at least a couple of years until the trees, shrubs and perennials get established and hopefully begin shading out or occupying a good bit of the soil to outcompete the weeds (or at least give them a run for their money). But in many cases (at least in my neck of the woods), people seem to get stuck on the 'wide of expanses of mulch among a few isolated plants' look. 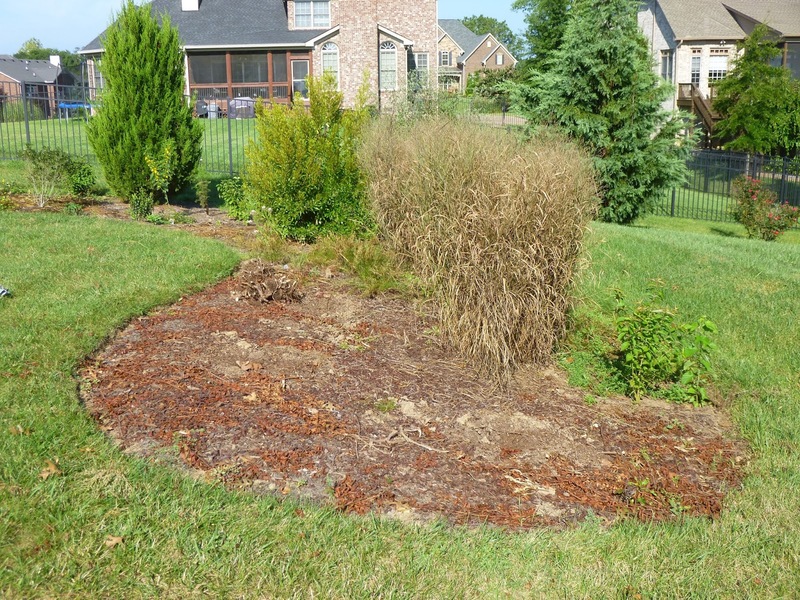 Not only is it ugly and bare looking (IMHO), but it requires annual or semi-annual remulching and (I suspect) pre-emergent herbicides to keep weeds from filling in all that bare space. Also, if the landscapers apply too much mulch repeatedly, I don't think it's especially healthy for whatever plants do live in those beds, which can get buried in mounds of wood chips. But what other options do you have? Theoretically, you could scatter some seeds and hope that floriferous annuals fill in the space until your larger plants have matured. I'm thinking of plants like Tagetes patula (French marigold) or Zinnia elegans (zinnia), perhaps a dwarf cultivar of Helianthus annuus (sunflower). But there are some drawbacks to this plan. If you are spreading annual seeds, you can't mulch too heavily (or spread pre-emergent herbicide, for obvious reasons). 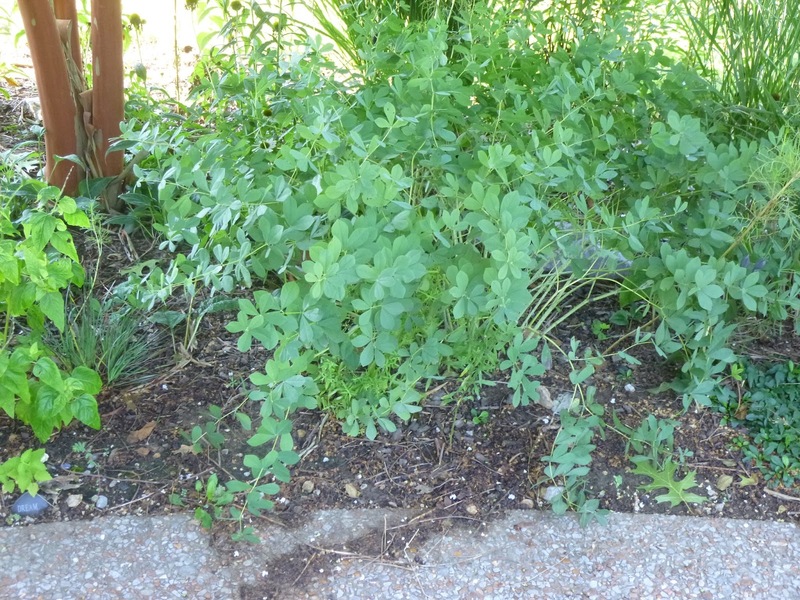 The right conditions for wildflower seeds to germinate might also be the right conditions for weed seeds to germinate, so you'll need to hand-weed the bed until the annuals get going and (again) start shading out the soil and outcompeting weeds. Some annuals can grow quite tall and bushy. 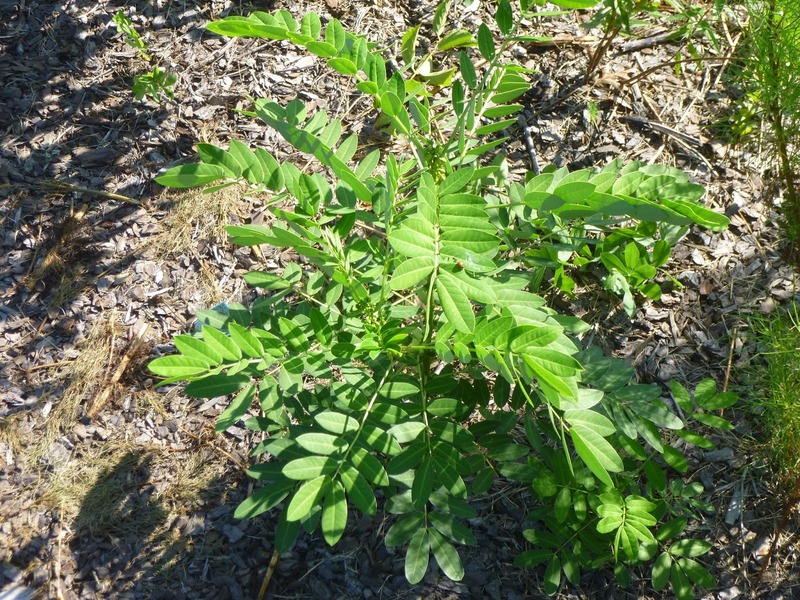 This year, I had about 1,000 volunteer Cosmos (C. bipinnatus) plants show up. I don't think I'm exaggerating. Having a lot of ground to fill, I let many of them grow into a mini Cosmos forest. It was lovely in June and July when many of the plants were in full bloom. But packed together, competing for sunlight and nutrients, many of the plants did not bloom at all. The dense growth attracted pests (spittlebugs, mainly) which drained the plants of vigor. Stressed by heat and humidity, many of the plants started to die - turning brown from the ground up. I could have uprooted these plants, but I decided to try to cut them off at the base, so that their roots would decompose in place and hopefully jumpstart the process of soil conditioning and improvement. Many of the seeds were probably eaten by finches before I started culling the Cosmos. Many other seeds are probably still on the seedheads that I scattered through the beds, so I am sure there will be a whole lot of Cosmos seedlings next year too. But next year I plan on doing a lot more winnowing early in the year when the Cosmos seedlings are still just a few inches tall. I'll hoe or chop or pull them at that stage when I don't need a lopper or a bypass pruner to cut them down. 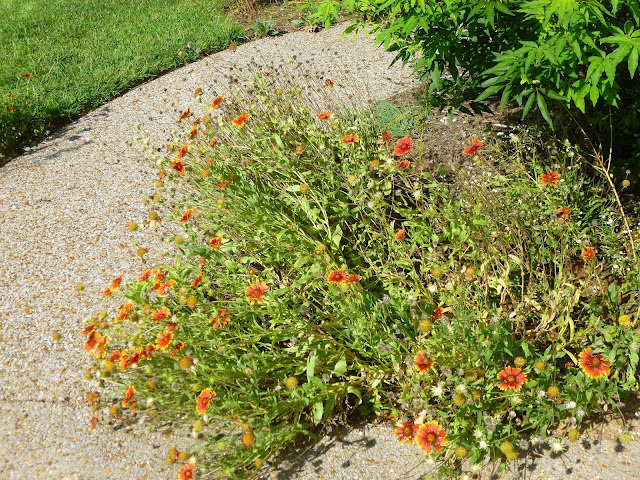 You can use a mass planting of blanketflowers (Gaillardia x grandiflora) as a groundcover. But Gaillardia has a reputation (deserved, it seems) for being a relatively short-lived plant. Odds are you may only get 2-3 years from a specific Gaillardia plant. Still, if your blanketflowers self-sow (as mine sometimes do), then they could continue to collectively cover ground even as individual plants die out. But are annuals even a wise choice? 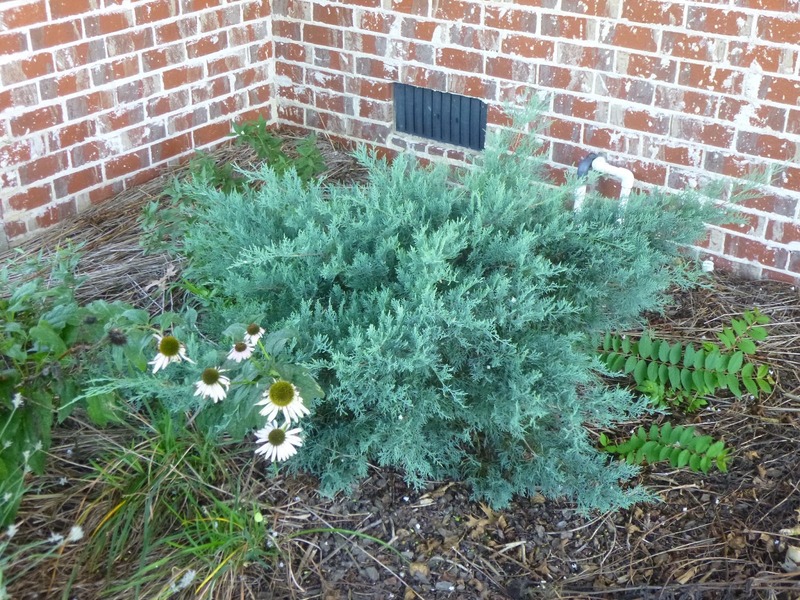 What are the other options besides annuals and mulch? Well, the two other obvious choices (am I missing any others?) would be perennial groundcovers and shrubs. 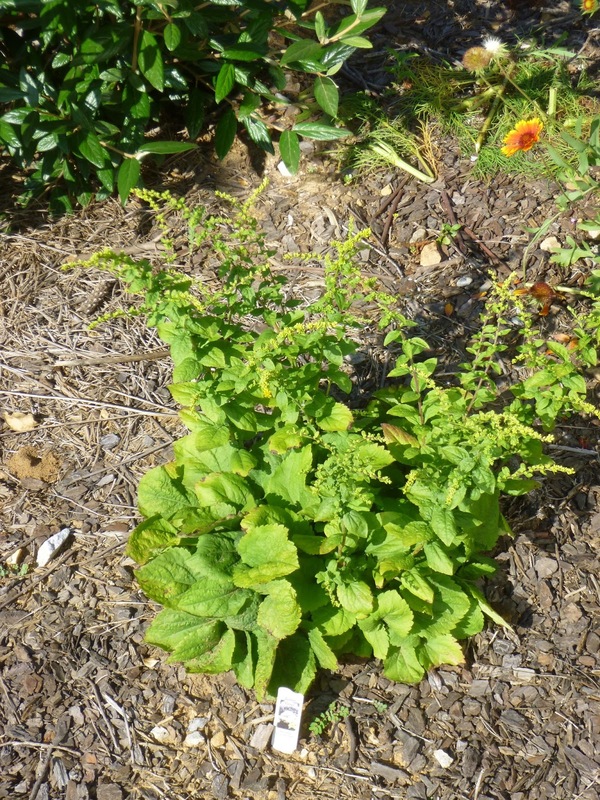 In both cases, of course, there's certainly a possibility that a weed will germinate and grow underneath another plant, but in my limited experience, weeds are much less problematic if you have a bed chock full of other garden plants. 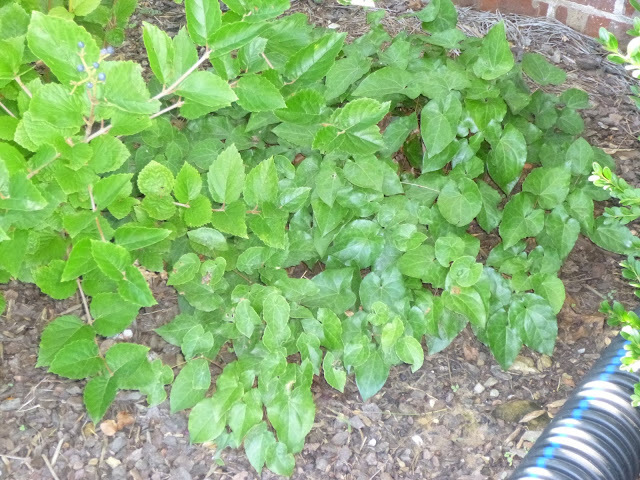 I have a few shrubs like Vibnurnum x pragense (Prague viburnum), Viburnum dentatum (arrowwood viburnum) and Myrica cerifera (wax myrtle) that do seem to shade out the ground beneath them pretty well and impede weed germination. 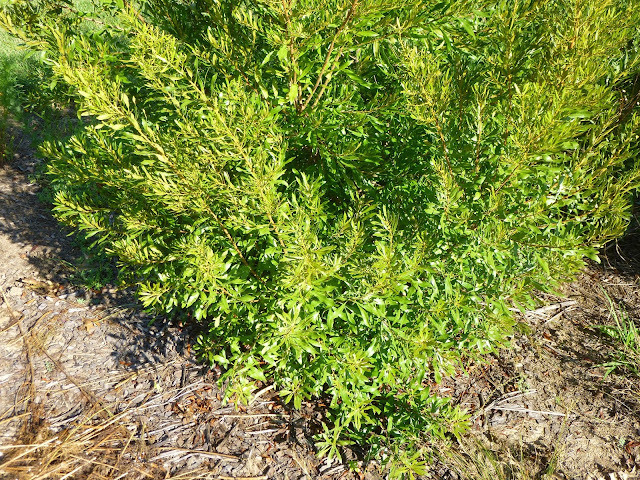 The evergreen foliage and bushy habit of this wax myrtle (Myrica cerifera) seem to do a good job of shading the soil and discouraging weeds. Of course, by their nature, upright or even rounded shrubs won't cover a massive amount of ground, at least not very quickly, because they want to grow up as much as (or perhaps even more than) they want to grow out. Other shrubs I grow such as Philadelphus 'Natchez' (mock orange) (UPDATE - I removed the mock orange from the garden in autumn 2016 and replaced it with a transplanted Viburnum dentatum) and Hibiscus syriacus (rose of Sharon) are even more upright. They have a very small 'footprint' that makes them easy to fit into a garden bed, but I think this upright form doesn't do much at all for impeding weeds around their base. So why not get a sprawling shrub with a groundcover habit? I've tried something like that a few times and often I have been less than pleased with the result. 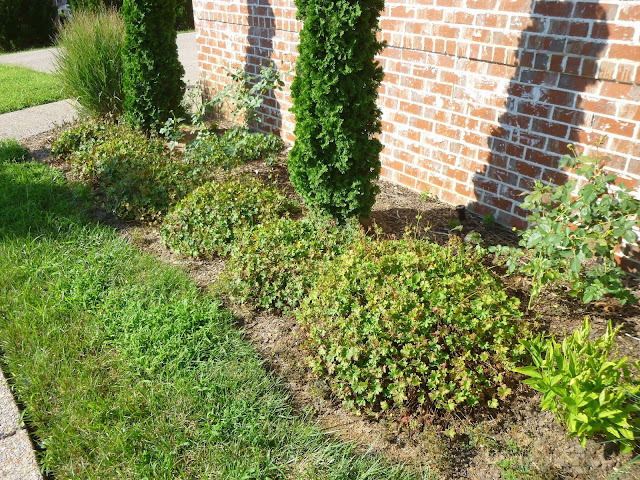 Ultimately, I've chickened out and shovel-pruned several of these groundcover-type shrubs. So far, that list of gone-but-not-forgotten includes Jasminum nudiflorum (winter jasmine), Rosa setigera (climbing prairie rose) and most recently Rhus aromatica 'Gro-Low' (fragrant sumac). 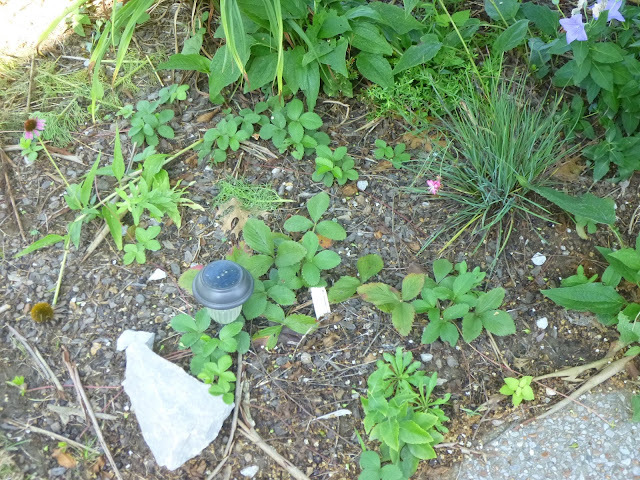 The problem for me is that all of these plants were (a) too rambunctious and (b) not really dense enough to block weeds. Take the Gro-Low sumac. 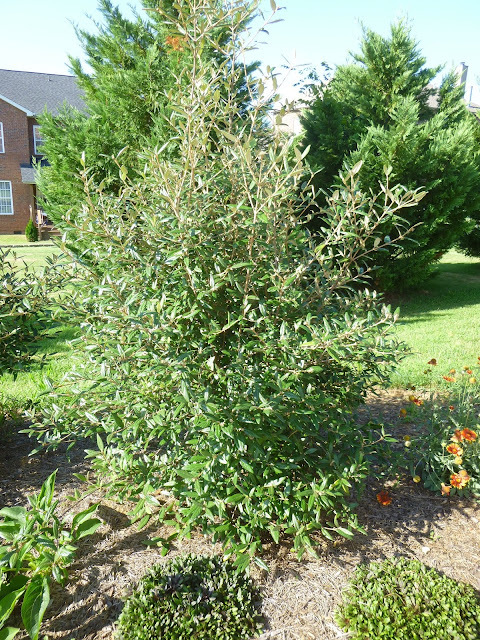 In a few years, a single one of my plants probably sprawled about 10 feet across -- and that was with multiple prunings. This year, the pace of growth really picked up and I couldn't keep the plant within the bounds of its bed even with pruning it every few weeks. I think there were stems that put on 6 feet of new growth this year alone. Now I recognize that for some people, a wildly rambunctious and fast-growing plant could sound exciting. Perhaps you want to remove all the grass on a large hillside and replace it with Gro-Low sumacs, letting them sprawl out and hopefully rapidly cover the hillside. Well, recall the story of Mickey Mouse and the broomstick in Fantasia. Even when the fountain was overflowing and the whole castle was flooded, the broomstick was hell-bent on adding more water. When the Gro-Low sumac reaches the end of its designated area, will it stop? I don't think so. Perhaps it would eventually slow down as the ends of the branches got further and further from the core... except that Gro-Low sumac (like both winter jasmine and the climbing prairie rose) has a tendency to tip-layer ... meaning that where branches make extended contact with the soil (a frequent occurrence in low-growing, sprawling plants), those branches tend to develop roots. So in a sense, the 'root ball' of the plant continuously expands, the plant gets stronger and sends up new shoots, which curve back down, make contact with the soil, develop new roots and the cycle continues. One option (I considered this before shovel-pruning the sumacs) might be to conduct a drastic pruning on the plants every winter, pruning them back close to the ground. It seems to me that there's a chance such continuous drastic rejuvenation pruning might weaken and then kill the plant eventually, but even if it did survive, you'd be looking at multiple months without much soil coverage - which would enable weed germination or (in our imaginary slope context) soil erosion. The bare space you see here was previously covered by three Rhus aromatica 'Gro-Low' shrubs. In three years, these shrubs filled the space and strove continuously to expand beyond the confines of this bed. Here's some of the Gro-Low foliage that I cut up while removing the plants. I'm letting the foliage dry on the back patio. 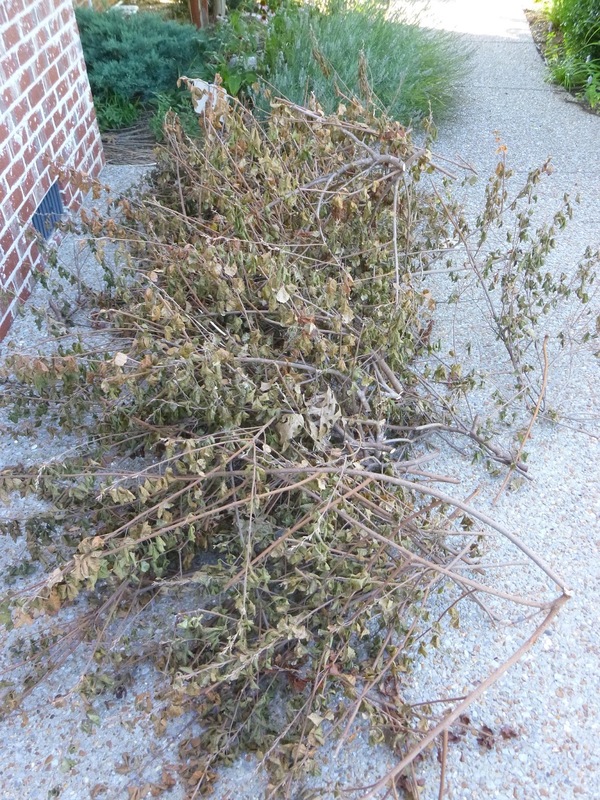 When the leaves get brittle, I'll sweep them off the plants so their nutrients can go back to the soil. I'll probably end up taking the branches to our local county-operated 'Convenience Center' where they'll be turned into mulch. You can of course go with an evergreen groundcover shrub. Depending on your climate and soil, you may have quite a few options in this category or you may have only a few (or perhaps none at all). In Tennessee, two of the best options I've found so far that fit this bill would be Juniperus virginiana 'Grey Owl' (some people think 'Grey Owl' is actually a hybrid juniper, but Missouri Botanical Garden lists it as a cultivar of our native eastern red cedar) or the prostrate version of the Japanese plum yew (Cephalotaxus harringtonia). Due to their evergreen nature, not only are they prettier in the winter (IMHO), but they also seem to do a much better job of covering the soil and discouraging weeds. As far as I know, neither of these plants actually roots into the soil as it spreads, which makes it much easier to prune the shrubs back if they start growing out of bounds. Since they spread at a reasonable pace (perhaps 12 inches per year), I have not found it especially challenging to control or direct their spread so far. 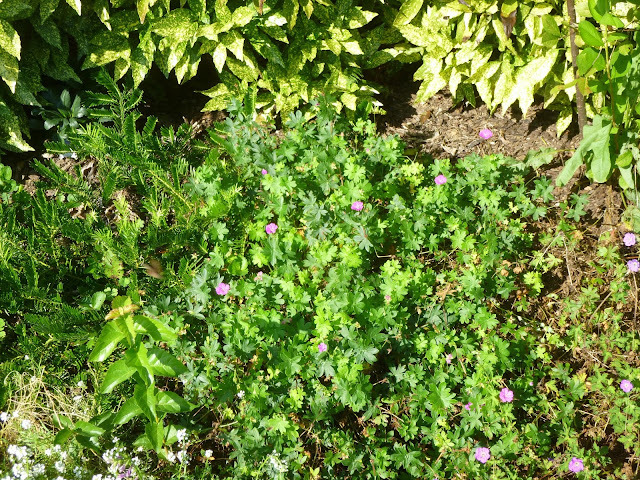 Beyond woody groundcovers, there are also perennial herbaceous groundcovers, and I do think this category offers some excellent possibilities -- with a few caveats of course. I think the biggest caveat is picking the right plant. I've tried certain perennial groundcovers (Pachysandra procumbens, Hexastylis arifolia) that have struggled and died (or barely survived) rather than covering any ground. Conversely, I've tried some exotic groundcovers like Ajuga reptans, Rubus calycinoides (creeping raspberry), Pratia pedunculata (blue star creeper), Ceratostigma plumbaginoides (hardy blue plumbago), Galium odoratum (sweet woodruff) and Teucrium chamaedrys (creeping germander) that all turned out to be more trouble than they were worth. 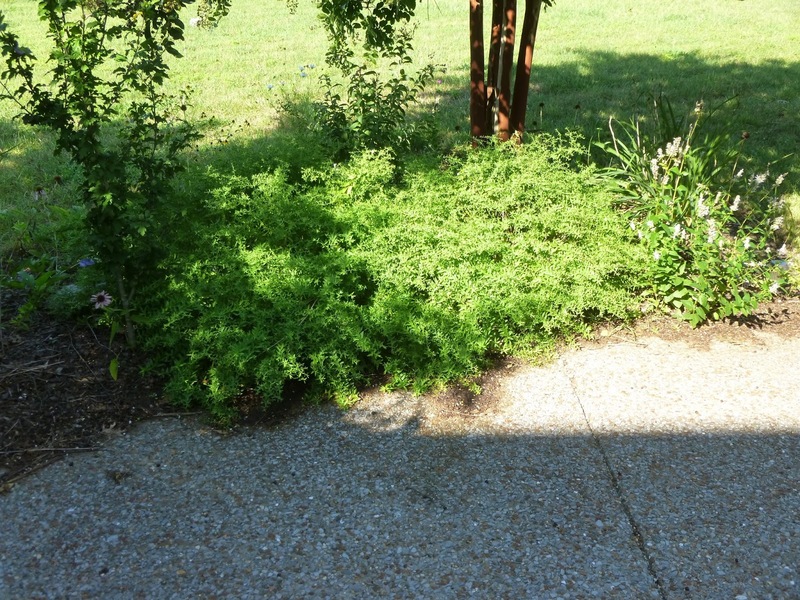 What makes an undesirable groundcover? As with certain woody plants, rambunctiousness definitely comes into the picture. 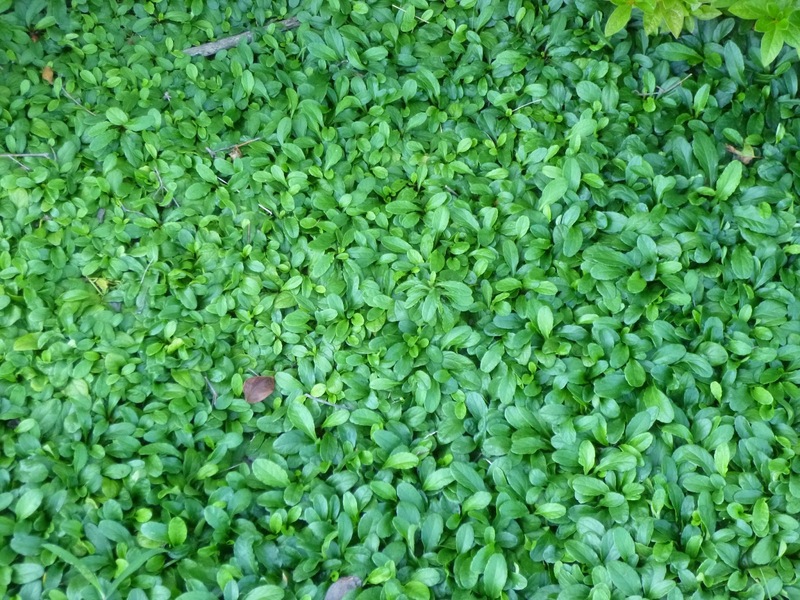 We all think we want a fast groundcover to cover lots of ground quickly, but what happens when the groundcover reaches the limits of whatever space you want covered? Do you want a constant battle with a bully that's trying to take over your whole garden -- and perhaps a neighboring natural ecosystem to boot? 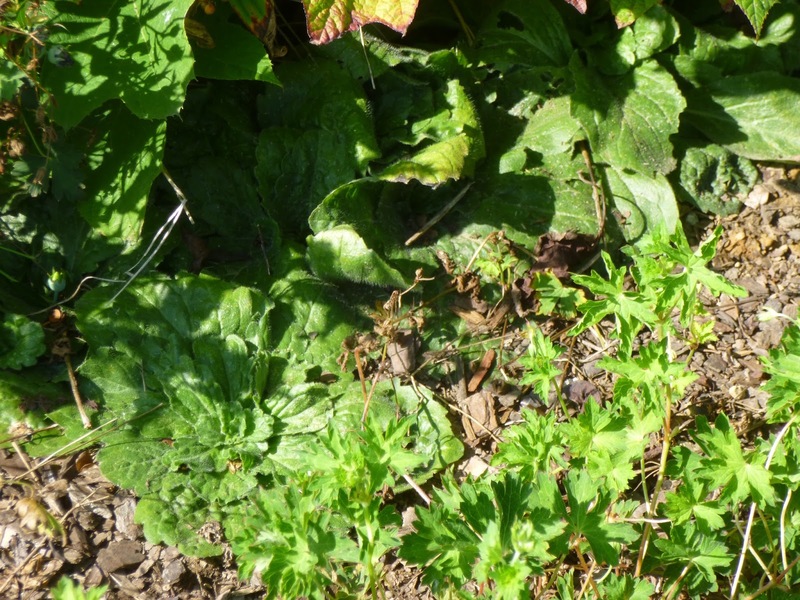 What other tendencies, behaviors or traits might make a groundcover undesirable in my book? 1) Underground operations -- Some groundcovers look innocent and well-behaved above ground, while secretly spreading a wide web of roots below the soil surface. 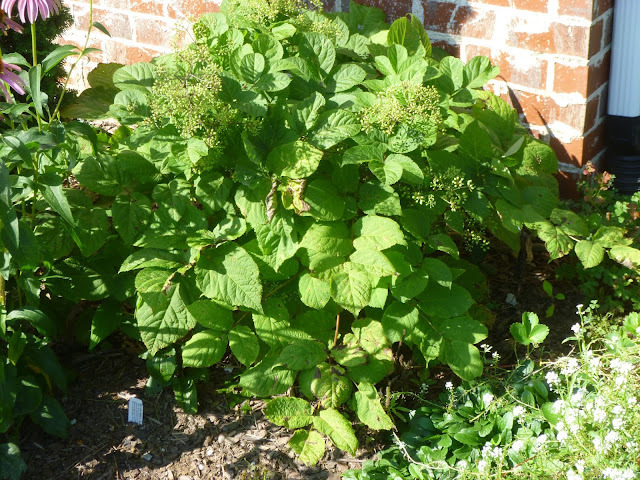 It can be very hard to control the spread of these plants. Also, if you do decide to try to uproot a groundcover that has spread its roots far and wide, there's a good chance you'll miss a piece of root that can regenerate a whole new plant when you're not looking. 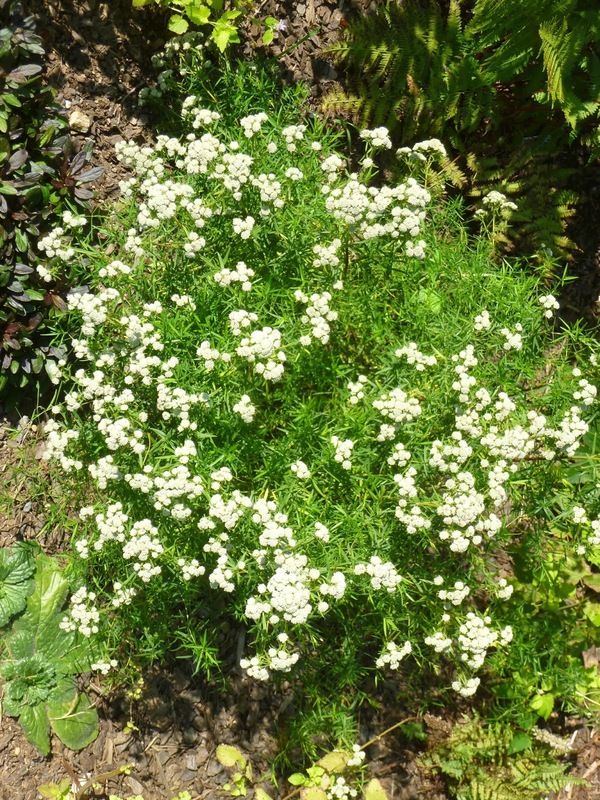 And if the whole top inch or two of soil is inundated with the roots of the groundcover, other plants in the bed could have difficulty competing for nutrients and other resources. 2) Woody bits -- In my experience, it's necessary to cut back the woody old growth on plants like creeping germander and creeping raspberry. That's not fun and it's certainly more tedious than dealing with a purely herbaceous groundcover. 3) Not too aggressive -- As with much of gardening (and life in general?) there's a bit of a Catch-22 here. You want a plant that's at least somewhat assertive. You don't want a pushover that lets any weed muscle its way through, but you (or at least I) don't want a plant that's going to dominate a bed and romp over everything else in its path, including small shrubbery (I'm looking at you Melissa officinalis, lemon balm). Epimedium species make great groundcovers for shade. 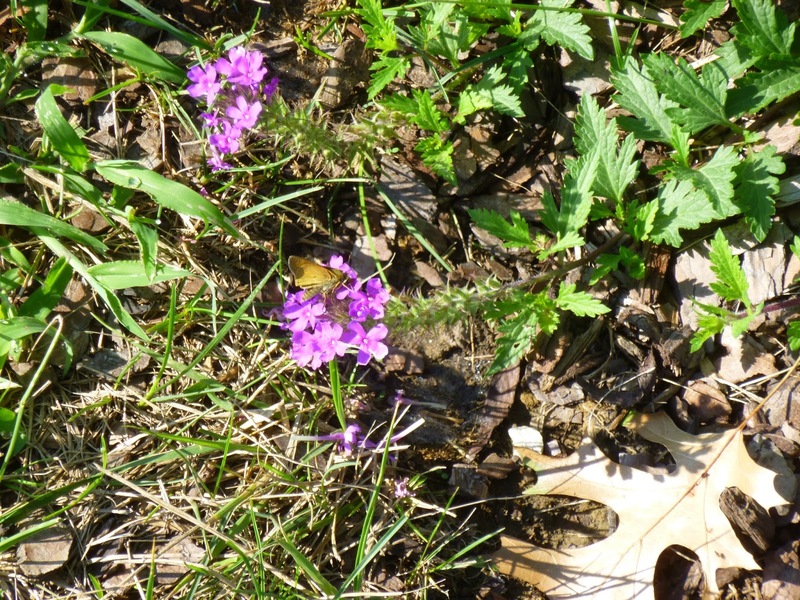 They spread very slowly - which is not great for covering ground, but does seem to make it easy to control their spread. 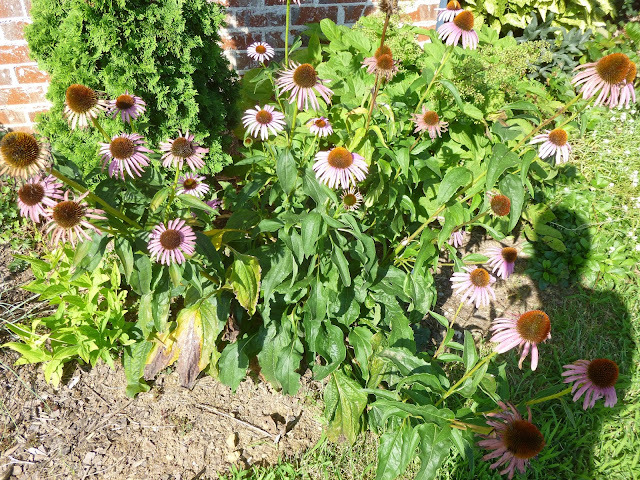 They don't form a mat of foliage, which makes me think you could have tall perennials (coneflowers? agastache?) popping up through the Epimedium if you wanted. They're also evergreen, which is nice both in terms of sheltering the soil in the winter and giving you something green to look at when much of the rest of the landscape is brown and/or bare. It's my first year trialing our native wild strawberry - Fragaria virginiana. as you can see, it doesn't have the uniform growth habit of an Ajuga, but it ends out runners and forms patches of plants here and there. It's too early for me to give a verdict on the plant yet, but so far I find it charming and it seems easy to uproot any runners that spread too far. I think many of the perennial geraniums like cooler temps than those we have in Middle Tennessee summers, but Geranium sanguineum seems able to beat the heat. It looks good here in partial sunshine, but seems able to survive even in nearly all-day sun. This geranium species also seems to spread quickly, but I've found it very easy to pull up patches that start encroaching on other plants. (It doesn't seem to root in very well at the edges, which makes it easy to pull up sections that spread too far.) I think I've seen a few seedlings, but not many. Geranium x cantabrigiense has more of a uniform, rounded growth pattern than G. sanguineum, but it spreads more slowly. It also tends to look more stressed by our heat and humidity in late summer, but in years past, I've seen that it recovers as temps cool off and it tends to develop some lovely autumn coloration. I've also found it easy to take divisions from these plants, and I think I'll take a few more divisions this autumn and trial them in some shadier spots. Here's a skipper butterfly on some rose verbena (Glandularia canadensis) flowers. It's also worth considering clumping herbaceous perennials that reseed (or can be propagated by scattering or burying seeds in your garden). 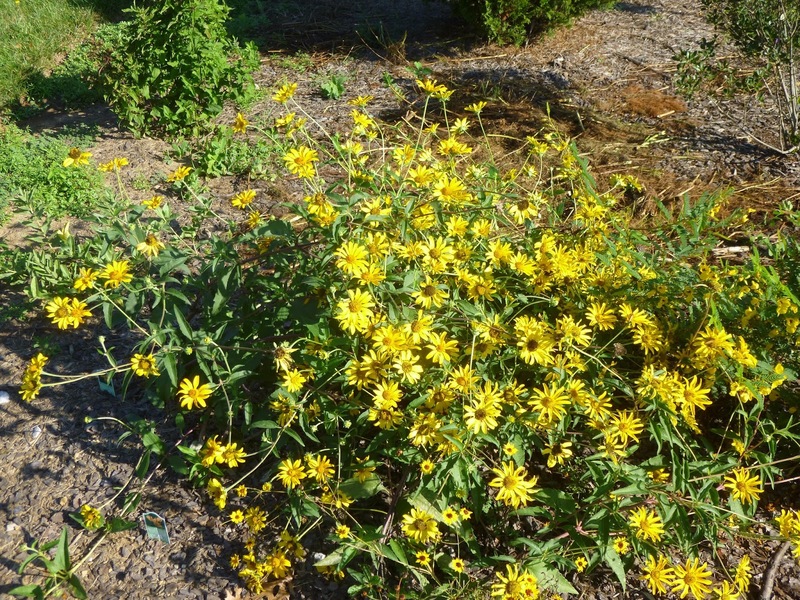 Plants like Agastache foeniculum (anise hyssop), Echinacea (coneflower) species or perhaps Heliopsis helianthoides (false sunflower) can block weeds, support wildlife, look beautiful and function en masse as groundcovers. Even some of the Baptisia (false indigo) species might fit that bill. This bushy coneflower occupies space, shelters the soil and blocks weeds. 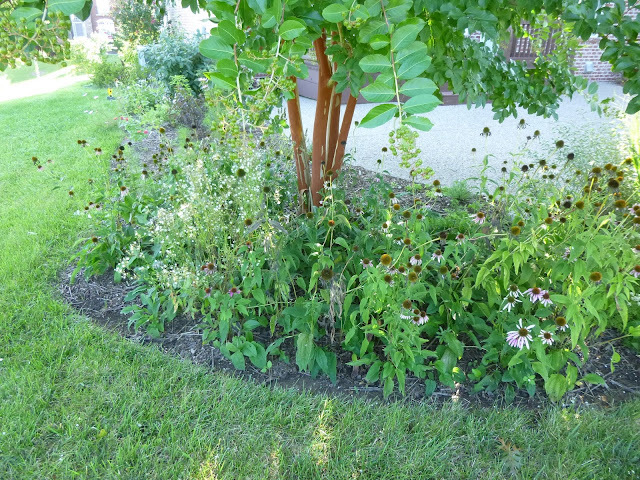 Here's a whole patch of self-sown coneflowers that function collectively as a tall groundcover. In some ways, I think there's something more appealing about this sort of groundcover than a uniform, ground-hugging Ajuga. And if you want to make room for some other plants, it's much easier to grab some coneflowers by their tall stems and dig them up than it is to try to rip out a section of an Ajuga mat. Self-sowing perennials like Agastache foeniculum (anise hyssop) growing close together can block out many weeds. 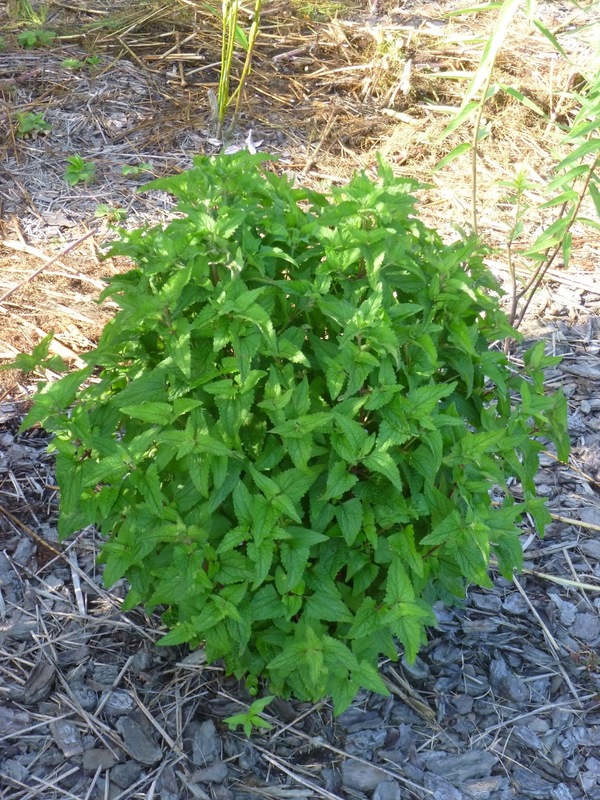 Bushy perennials like Aralia racemosa can shade out and block many weeds. Unlike a shrub, there's no worry about pruning this plant to keep it in check. Come autumn, the thin stems of Aralia racemosa will collapse and quickly decompose back into the soil. 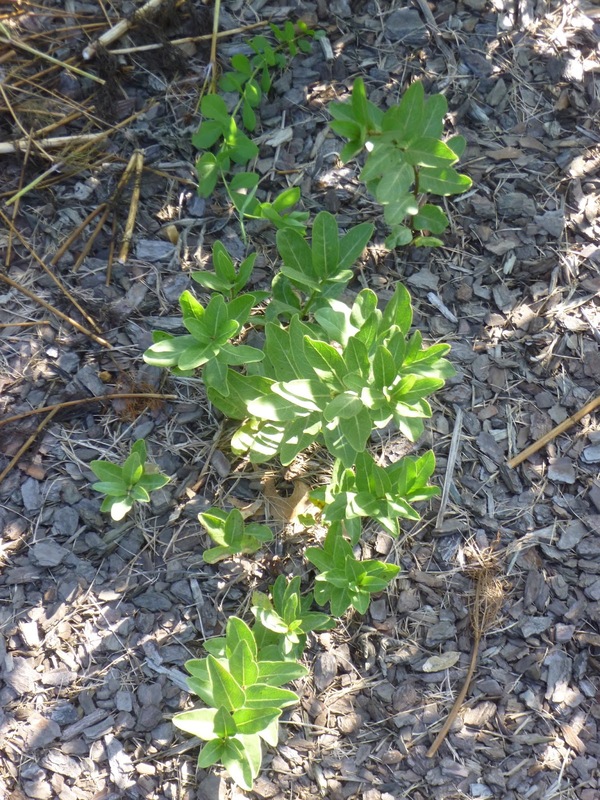 Some milkweeds have an upright growth habit, but this particular species (Asclepias viridis) seems to have more of a groundcover habit. This bushy blue mistflower (Conoclinium coelestinum) has not spread much yet, but it has a reputation that makes me think it could work as a groundcover. So far, it hasn't even flowered and yet I like it quite a bit anyway. The dark foliage seems dense enough to block any weeds and it seems like the perfect height - not so tall that it would compete with most bushes, but tall enough both to block weeds and to give me a good grip if I want to pull or cut any errant stems. Native narrowleaf mountain mint (Pycnanthemum tenuifolium) also seems to do an excellent job of blocking weeds in its immediate vicinity. Pay not attention to the geranium in the foreground. What I'm trying to show here are those ground-hugging rosettes of foliage lurking beneath the oakleaf hydrangea in the background. That's Erigeron pulchellus (Robin's plantain), and it actually seems to make a great semi-evergreen native groundcover. In sun or shade, aromatic aster (Symphyotrichum oblongifolium) makes a sense and bushy perennial groundcover, especially if the growing tips are cut back in early summer. I don't think aromatic aster spreads from the roots, but it does seem prone to self-sowing, which could help it cover quite a bit of ground over time. UPDATE 4/17 - Ended up pulling these too. As you can see, they're pretty wild looking most of the year. The autumn flowers are spectacular, but don't last all that long - maybe a few weeks? They're not very appealing in winter, a pain to cut back and they self-sow a bit too enthusiastically. As you can tell, I'm still rolling groundcover ideas around in my head - and probably will continue to do so in the years ahead. I apologize for the lengthy ramblings and would love to hear your thoughts on the matter! If you were planning to start a new, large garden bed, how would you plan short-term and long-term to keep down the weeds? 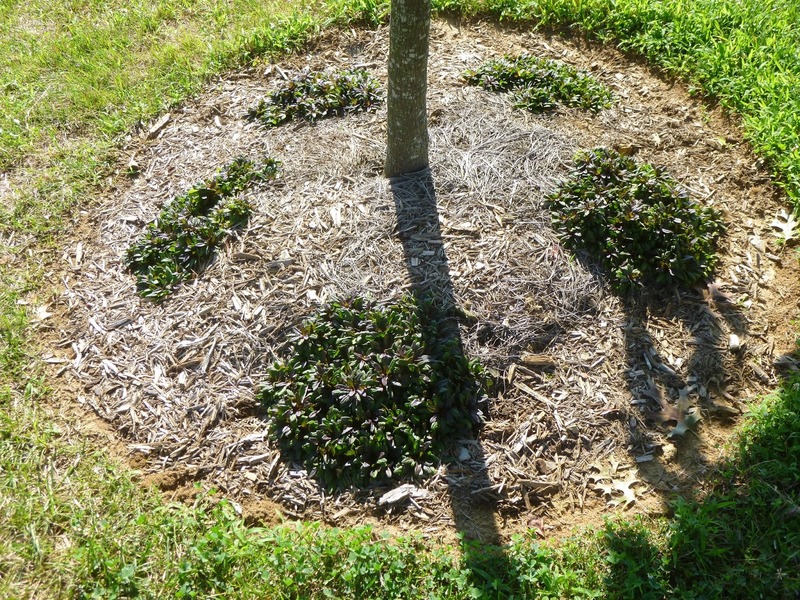 Do you see mulch as a viable long-term choice or a short-term stopgap? 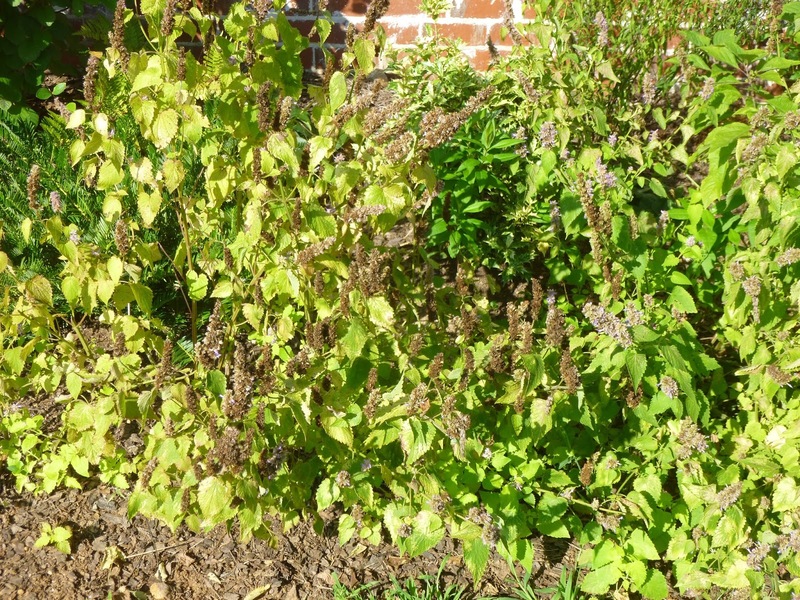 If you were looking for an alternative to mulch, would you rely on trees, shrubs, clumping perennials, groundcover-type perennials or self-sowing annuals to fill in the space and outcompete (at least some) weeds?